Taken with the Canon Powershot G12, mon. The only camera fit to bring for limin’ in the sun. Sorry for the delay in posting! I promise they’ll come a bit more often!!!! Stay tuned! While I frequently say that aside from my hometown, St. John is my favorite place on earth, the more accurate statement would be that Gibney Beach on St. John is my favorite place on earth. This idyllic little stretch of beach on the North Shore is never crowded and even when a few other people are on the beach, they are usually tucked away in the little palm and seagrape tree alcoves so that you barely see them. Crystal aqua waters, white sugary sands, palms behind you, and shallow waters with a soft sand bottom for frolicking in the sea that leads out to deeper water with excellent snorkeling. The reefs are decent to look at and there are large sea turtles and many fish to observe, as well! My favorite thing on this beach is a palm tree that bends over the water and has a tire swing attached (photos to be posted soon). The swing is fun, especially when high tide is in, but the curve in the tree is perfect for draping a beach towel over the trunk and laying down, with the trunk as your cradle, and listening to the gentle waves rolling up on the sand just a few feet below you while warm breezes rustle through the palms. And if you happen to fall asleep, well, that is just fine too because you’re on island time! Interestingly, the beach is also known as Oppenheimer Beach. And yes, it is that Oppenheimer…the Manhattan Project/atomic bomb guy. Stay tuned for more photos…and enjoy a mental vacation while looking at this one! Welcome to Hawksnest Beach!! I love this silhouetted portal to the sea! This was one of my first glimpses of the splendor of St. John. Upon our arrival to the island, it was a torrential downpour, making checking out the beaches a little less than desirable after a full day of traveling. We settled into our house, Blue Moon Rendezvous, and then went into Cruz Bay to plant ourselves at a cafe to get some beachfront munchies, while watching the rain streaming down through the palms onto the water and sand. Fortunately, the rain stopped just before sunset, so we raced up to the North Shore and stopped at the first easily accessible beach–Hawksnest! And, oh how gorgeous it was! I dipped my toes in the water and then started taking some photos with long exposure since the light was starting to dwindle. Of course, this one was taken with the Canon Powershot G12. Sorry for the long delay between posts! But stay tuned for more tropical shots! Its Cruz Bay, St. John, USVI! Lovely sunset, eh? 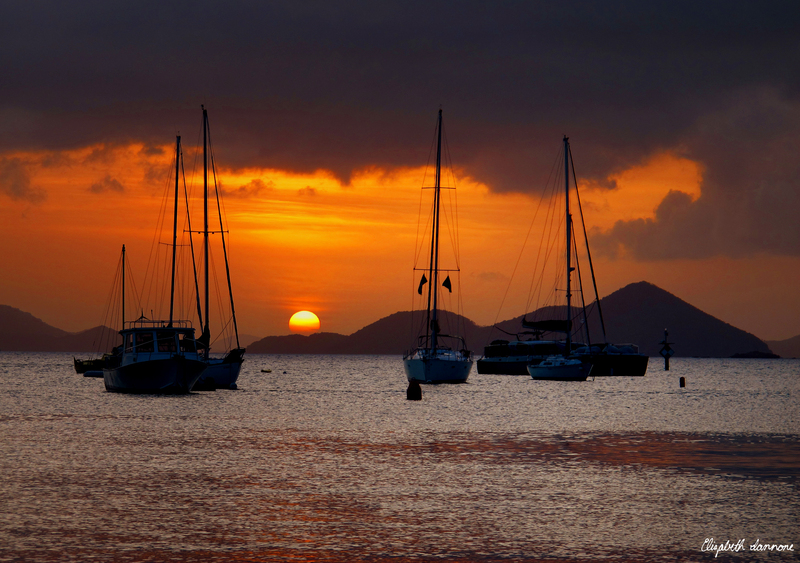 Well, here’s the very special part…sunsets over St. John are very often silvery sunsets, rather than flame-hued. Well, on this evening, the sky was shocking shades of pink and orange…and the entire town took notice! Everyone was packing the streets and balconies to gaze at the sunset…and I was so happy to be a part of it! Taken with the Canon Powershot G12. Stay tuned for more snapshots of the USVI! Welcome to the beautiful St. John of the US Virgin Islands!!!!!!!!!!!! Let’s just say that this place is my paradise. So many wonderful memories, so many amazing experiences, so much serious relaxation. To kick off the USVI photos, we have THE classic shot of Trunk Bay on St. John. It was a beautifully sunny and clear day, so the colors in the water were positively mesmerizing! Enjoy, and I cannot wait to share St. John, USVI from my perspective with everyone!! Of course, taken with the Canon Powershot G12! Of course, taken with the Canon Powershot G12. Slight sepia tone added in Photoshop CS5…I love how the filter enhances the vibe of the photo! Alcatraz, in Black and White. Captures the haunting aspect of the island prison. Alcatraz, in color. With a seagull! Oh! I almost forgot to state the obvious: all photos taken with the Canon Powershot G12. Forget that newfangled G1X that just came out…I love my G12 (and my lenses/underwater housing won’t fit the new version…a very expensive reason to stick with the G12!). Stay tuned for more of California!